William Redington Hewlett (born in Ann Arbor, Michigan, died in Palo Alto, California) was a famous Businessman from USA, who lived between May 20, 1913 and January 12, 2001. He became 87 years old. William (Bill) Redington Hewlett together with David Packard founded on 1 January 1939 the U.S. technology company Hewlett-Packard. He received his BS in 1936 from Stanford University and put his master in 1939 at MIT. In 1939 he co-founded with David Packard Packard's garage with $ 538 in their company. Packard stood out as an administrative specialist, while Hewlett contributed many technical innovations. Hewlett-Packard grew to become the world's largest manufacturer of electronic test and measurement instruments. Later the company became a major manufacturer of calculators, personal computers, laser printers and inkjet printers. 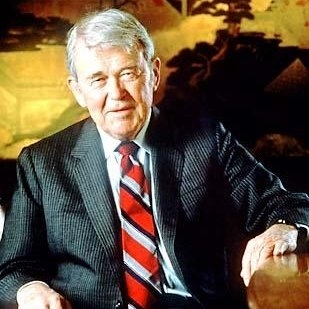 Hewlett was president from 1964 to 1977 and from 1968 to 1977 CEO of Hewlett Packard, then he was replaced by John A. Young. He remained chairman until 1983 of the Executive Committee 'to 1987 and then served as deputy chairman of the same. In 1995 he received the 'Lifetime Achievement Award of the Lemelson-MIT Prize. He is born under the zodiac taurus, who is known for Security, Subtle strength, Appreciation, Instruction, Patience. Our collection contains 3 quotes who is written / told by William. "Never try to take a fortified hill, especially if the Army on top is bigger than you are"
"Men and women want to do a good job, and if they are provided the proper environment, they will do so"
"All business proceeds on beliefs, or judgments of probabilities, and not on certainties"